Nieuwe Hollandse Waterlinie is part of the Tentative list of Netherlands in order to qualify for inclusion in the World Heritage List. I use to study in Utrecht and walked/biked a lot in the area around the Hollandse Waterlinie. So i thought i might share with fellow travelers what they can best do in case they are ever in the area and want to see the nearby fortresses. The fastest and easiest way to go there from Utrecht Central Station is by taking the bus to Wijk Bij Duurstede and to then get of at the busstop Oud Amelisweerd. When you step out of the bus you will see an old mansion on your left and railwaytracks/highway on your right. You want to cross the railway and go through the tunnel underneath the highway and you will see Fort Bij Vechten. Fort bij Vechten is possibly one of the most accesible fortresses on the linie. You can freelly walk into the inner courtyard and climb on top of the walls of the fortress. Inside the fortress you can find the waterliniemuseum. Which is quite pricey (5 euro per person) but gives a clear explenation what the waterlinie was build for and how it was used for through it's history. Which might be a nice introduction. If you walk around the fortress you will find west of it another Dutch tentative sight, the remains of the frontiers of the Roman empire. Fort bij Vechten was build on top of an old Roman castellum and they show there, through a large floorplan made out of diiferent colored bricks, how the Roman armycamp would have looked. If you go back to the busstop you now gp in the direction of the mansion. This mansion is Museum Oud Ameliswaard. Inside they have beautiful antique Chinese wallpapers which they uncovered during a restoration. It maybe is not really worth a visit if you only travel for World Heritage Sites but I have heard the museum is really struggling to keep afloat and I kind of think they deserve the business. They have probably one of the most genuinely foreignerfriendly and helpful staff of volunteers i have experienced in any museum. They are proud of the history of their little mansion and enthousiastically love telling foreign visitors about it in broken English. If you go north of the mansion you will reach the Amelisweerd/Rhijnauwen estate. In the middle of this estate you will find another fortress called Fort Rhijnauwen. Fort Rhijnauwen is the largest fortress on the waterlinie and is saidly not accesible because it is still being used by the military. It is however very nice to walk around it. The estate is a landscape existing out of farmland, planted forrest and lot's of water. In the summer it is also a very nice place to spot waterbirds and it is overall a nice and quiet area to walk around in. I hope this review was useful to someone and that you can enjoy your next visit there. The "Nieuwe Hollandse Waterlinie" (New Dutch Defence Line) is on the (old and new) Tentative List as an extension to the Defence Line of Amsterdam. It is also a Defence Line based on inundation. At the north, it hooks up with the Defence Line of Amsterdam near Muiden. This Defence Line (1871) was developed to replace an older one that had been protecting parts of Holland. It incorporated the defence of the city of Utrecht. It is 85km long and still very visible and in good shape. I visited a fortress at the southern edge of this Line: Loevestein. It encloses a castle that is well known in Dutch history: it is from here that the legendary escape of the imprisoned jurist Hugo Grotius inside a book case took place. The fortress/castle lies in a very pleasant recreation area, especially on a sunny day like this. It sits on a strategic position at two main rivers, the Meuse and Waal. 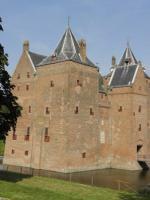 The castle is enclosed by a moat, then by the fortress and another moat. It attracts quite a lot of visitors, and I noticed that it is popular with foreign tourists too. It really is a peculiar construction, such a great defence work relying totally on the force of water. It often suffered from floodings itself too. The castle is made of connected tower houses and has only a tiny courtyard. The area around it is now a protected landscape. There are bike paths and hiking trails. A good place to visit for a half day trip, with a very Dutch atmosphere.